There’s a warm squish between my toes which gradually becomes cold. The tannin rich waters of the swamp squelch up to my ankles as the soft mosses filter it clean. There’s a knack to bog walking, one needs to move quickly, and keep their feet widely spread so as not to create too fine a point of pressure. There’s horror stories when it comes to bogs, about people who were swallowed whole and how the low oxygen environment would preserve their bodies for decades. Personally I find the bog peaceful, and the gentle bounce of the mosses underfoot relaxing. I never wear shoes in the bog, I prefer to feel the water, whether sun warmed or autumn chilled. 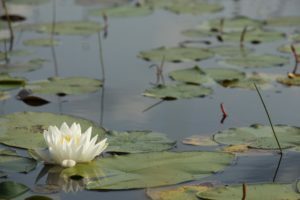 I also prefer to feel the differences in plant matter because the bog is a very delicate and unique ecosystem. 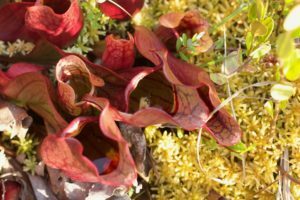 Besides the moss, there are beautiful carnivorous pitcher plants, along with smaller ones that use sap to capture flies that pass by. 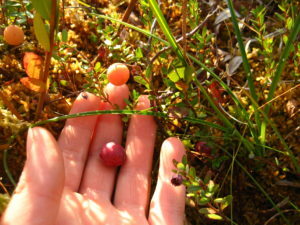 There are baby tamaracks, small bushes, and of course the reason I’m here, cranberries. All the plants at my feet deserve respect and care not to harm them, especially the pitcher plants. This season has been unusual for the cranberries, there has been a lot more rain, and huge shifts between 85 degree days followed by chilly 40 degree nights. The cranberries are not doing so well, but everything else appears to be thriving. It seems as though a small green warm has wheedled its way into almost 50% of the berries, and eaten them from the inside out, some are even rotting on their stems before ripening. There’s patches here and there where things are healthy though, and today I don’t take much from them, perhaps just enough to make a sauce for the end of harvest season. Cranberries are loaded with vitamin C. Richer than most other things we use. Vitamin C is necessary for good tissue health and immune functioning throughout the body, and it’s great to get such a strong dose of it before the winter months, in a place where vitamin C would not have been available again until spring. They can be dried, canned, tinctured, jammed, sauced, and syruped. I like to freeze them and add them to things throughout the year, or just pop a few every now and then for a nice natural dose of vitamin C.
Another thing that cranberries have in abundance is a special type of sugar which prevents bacteria from adhering to the lining of the urethra. Which means it’s a good medicine for preventing urinary tract infections, as well as fighting ones that have already taken hold. 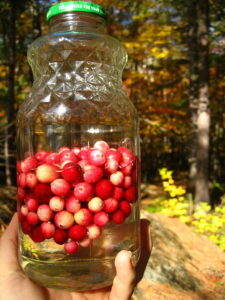 You usually need quite a bit of cranberry to do this (strong doses of the unsweetened juice throughout the day are recommended), so using these small wild batches in this way is not very efficient, but it’s good to know the medicine is there. Smaller doses of cranberry can help with urinary incontinence which is due to laxity of tissue, and in this way, these small batches are well suited. However you choose to enjoy your cranberries this season, I hope you take a moment to remember where they come from, and consider the fact that some species (like the ones out here in the midwest), only produce a single berry per plant.